We have specialized in manufacturing & supplying a broad spectrum of split bolt connector round heads which is made of high conductivity copper alloy with captive saddle. With an operating temperature ranging from -55°C to 100°C these are supplies in natural copper alloy or electro tinned. This range of split bolts is made of high conductivity copper alloy with captive saddle, which applies a distributed pressure to conductors. 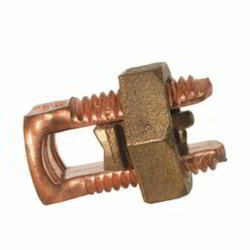 These are widely used for joining aerial hard drawn copper conductors or insulated copper conductors. We also offer these bolts in natural copper alloy or electro tinned. Looking for Split Bolt Connector With Round Head ?